"And also that ye might know of the coming of Jesus Christ, the Son of God, the Father of heaven and of earth, the Creator of all things from the beginning." 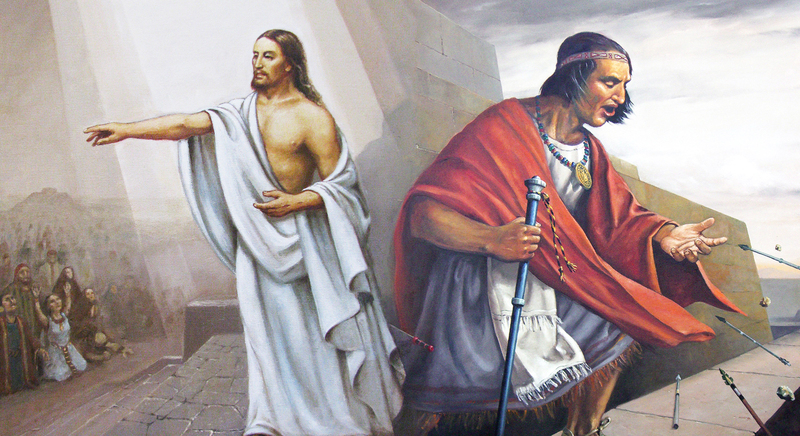 After delivering the important prophecy concerning the signs which would herald Christ’s birth,1 Samuel the Lamanite explained that he was preaching among the Nephites that they might “know of the coming of Jesus Christ, the Son of God, the Father of heaven and of earth, the Creator of all things from the beginning; and that ye might know of the signs of his coming, to the intent that ye might believe on his name” (Helaman 14:12, emphasis added). Thus, in explaining Samuel’s significant use of biblical language, Hopkin and Hilton suggested, “It may be that as an ‘outsider’ Samuel sought to bolster his authority by using language similar to that found on the brass plates.”7 Along a similar line of thought, Samuel’s use of various traditional prophetic speech forms is evidence of his conscious desire to speak in a voice that, according to Parry, was “indicative of prophetic authority and prerogative.”8 These modes of expression gave his words a ring of power and truth. After having identified seven distinct literary sections in King Benjamin’s famous speech, John W. Welch noted, “The all-important sacred name is given at the very center of section 3 (see Mosiah 3:8), and the crucial terms on which the efficacy of the atonement depend are stated at the precise center of section 4 (Mosiah 3:18–19).”9 Thus the central importance of this sacred name-title likely held deep religious significance to the Nephites in Zarahemla, whose ancestors unitedly centered their lives on Jesus Christ and covenanted to become His sons and daughters through His atoning sacrifice. Echoing Benjamin’s rhetorical placement of this name at the center of his coronation speech, Samuel placed Christ’s special name-title near the midpoint of his own prophetic judgment speech. 1. See Book of Mormon Central, “Why Did Samuel Make Such Chronologically Precise Prophecies? (Helaman 13:5),” KnoWhy 184 (September 8, 2016). 4. Donald W. Parry, “‘Thus Saith the Lord’: Prophetic Language in Samuel’s Speech,” Journal of Book of Mormon Studies 1, no. 1 (1992): 183. Parry labeled the six prophetic forms as (1) the messenger formula, (2) the proclamation formula, (3) the oath formula, (4) the woe oracle, (5) the announcement formula, and (6) the revelation formula. (pp. 181–183). 10. Modern prophets also frequently use prophetic language. See Book of Mormon Central, “Why do Certain ‘Treasured Words’ Appear So Repeatedly in General Conference Talks? (2 Nephi 25:26),” KnoWhy 69 (April 2, 2016). 11. Richard G. Scott, “The Power of Scripture,” Ensign, November 2011, 6, online at lds.org.